Checking in. Long security lines. Delayed flights. Taking a family vacation can be fun, but actually getting to your destination can be rife with stress. Read on for a few ways to keep calm during seasonal travel. The last thing you want to do when taking off on a family vacation is worry about last minute details or whether you forgot to book "this" or "that." So, plan your vacation ahead of time. If possible, get a travel agent involved so you don't have to scour websites for kid-friendly locales or hotels. Also, plan your seasonal travel accordingly. Instead of travelling to a place that's packed in the summer (say, a theme park), head to a mountainous region (like Ontario's Blue Mountain), which is known for winter activities, but also offers lots of summer family fun. Exposing your children to travel is incredibly important when they're young. 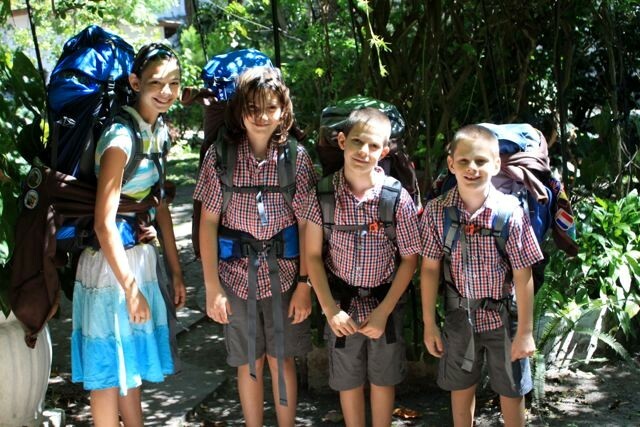 They'll learn about different cultures and get to experience how various people live. The only problem? Toting them around the world can be difficult, especially if they're temperamental. So, why not plan to stay local? There are hundreds of great, interesting and world-class locales across North America whose entry requires little more than a passport. When kids are in tow, packing a few handy products for long-haul flights can save you from a lot of stress and will keep your little ones occupied. Think crayons and colouring books, stickers and card games, or travel-sized options of their favourite games. And always carry a first-aid kit. Make sure it contains everything from antiseptic to bandages and thermometers. Having these items on hand will ensure you don't scramble to find a first-aid station when small accidents happen. When travelling with babies, it's also a good idea to fill a carry-on with diapers and wipes. Unless you're staying in North America, you may be hard pressed to find a bank machine that will accept your debit card (you also don't want to get dinged with huge transaction fees), so plan your budget and money needs accordingly. Visit a bank and withdraw a small amount of cash to cover little things like taxis or lunches. If you're travelling abroad, a bank also can help you with traveller's cheques. And, always bring a credit card or two. Many offer great exchange rates, low transaction fees, and insurance coverage. There are a few things you can do before you leave to ensure stress-free safe travel. One is to photocopy all of your travel documents (passports, hotel information, credit cards) and pass them on to a loved one. In the event something happens, or your important documents are stolen, that person will have all of the information you need to get replacements. Talk to your children about security and X-ray machines before they walk through the scanners (they can appear scary to little eyes). Also, ask the airline you're travelling with if they have any special requirements for young children (like a child seat); this will prevent the shock of finding out unknown information at the airport.